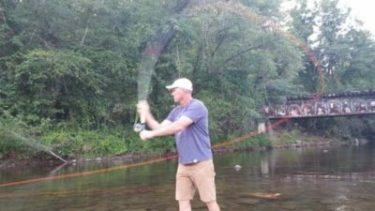 Improve your tracking for fly casting accuracy is another topic that has been on my radar for some time now. The definition of tracking has a plethora of meanings from the dictionary. In fly casting, the meaning implies a two-fold process of either straight or referring to a course or route the rod tip traveled taken from fly casting definition page. Tracking– 1) A term used to describe the rod tip traveling in a straight line without side to side wobble during the casting stroke (see also rod wavering). 2) A course or route traveled by the rod tip during the casting stroke or line positioning drift (this used to describe more advanced casts that deviate from straight). The first tracking definition addresses the rod tip traveling in a straight line and is used most often for accuracy. It encompasses all skill levels of fly casting for accuracy. Rod Wavering is another term I used to describe the side to side rod wobble during the casting stroke. Rod wavering is a fly casting fault when attempting straight tip path tracking. Tracking is often a common fault with new fly casters on the stream because they are still learning how to cast a fly line straight. Many skilled anglers never leave this level of straight tracking. Tracking straight is a discipline for accuracy fly casters which is perhaps why it receives so much attention. The second tracking definition is used for more advanced casts that make use of waves. Fly casting often scribes a rod tip path which deviates from straight. This is dangerous and controversial to many! Now the tip path is dealing with three-dimensional rod tip paths. This often scares many of the two-dimensional folks away. When we use these motions during the casting stroke they become part of the casting stroke motion just like Zoro with his sword! The important thing to remember is that we are influencing the fly leg of the loop when performed during the casting stroke. We call these transverse waves among the instructor community. Examples of these used in presentation casts include casting in multiple loop planes, S turns, corkscrew, curve casts, pile casts, and the list goes on! When we perform the waves right after the casting stroke than the transverse wave effects primarily the rod leg of the loop. These are called aerial mends. It is much easier to dial in the amount of mend you need for presentation casts while the line is in the air rather than water. Why wait for it to become a stack mend roll cast for a re-positioning of the line when you can do a quick wiggle of the tip in the air? Make it easy for yourself and master aerial mends. The progression usually starts here and over time you will learn to introduce them into the actual casting stroke (route tracking). 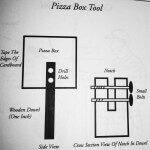 The pizza box tool was described to me tying flies at the late night sessions in 1988. The location was Cottonwood Camp on the Big Horn River with neighbors Doug Swisher and Carl Richards. 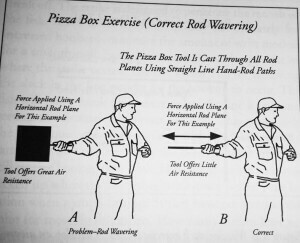 The diagram below is included in my text “Casting Angles”, hence rightly named the pizza box tool or Swisher’s tracking tool. A great correctional tool for major tracking issues! It is simply a big pizza box, a one inch round dowel about 16″ long, some duct tape, and a couple of short bolts. This simple design has helped me over the years when teaching groups for correction of tracking flaws. The picture below pretty much sums it up better than the verbal description and is one of the diagrams from my book “Casting Angles“. If the hand deviates from a straight path, then the air drag increases on the box. You can really feel the difference when the air drag catches on the box! Many wrist action fly casters that cast 25-30 feet struggle with longer distances. As soon as you bring out 40, 50, 60 feet of line they end up with major tracking issues. One common tracking issues arise toward the end of the back cast and the wrist rolls out. The reel points out to the side, rather than in front of the target. This causes the line to swing around a big circle in back. This wild wave carries back into the forward cast. This is where the pizza box really helps as an aid for correction. The next correctional tool is my friend and fellow MCI instructor David Lambert from Jacksonville, FL. David told me about using one of these around 1995 at an IFFF conclave. All that is required is a laser pointer like the little red dot lasers from a dime store. The laser pointer is used for both types of tracking described above. When you use this device with a really large ceiling, then it is like having a 40-foot rod! The use of a red dot laser really helps improve your straight tracking quick. As an example, stand right next to a wall with the casting hand making vertical strokes. Follow the laser dot on the ceiling and you have an excellent correctional tool. I like the laser dot for a better understanding of route tracking. Hope these tracking tips help you to perfect more accurate casts!